I've always said that I won't feel as if I have a complete 18th century wardrobe until I have a robe à la francaise or sack gown. In order to make a full ensemble I will also need pocket hoops and petticoats. 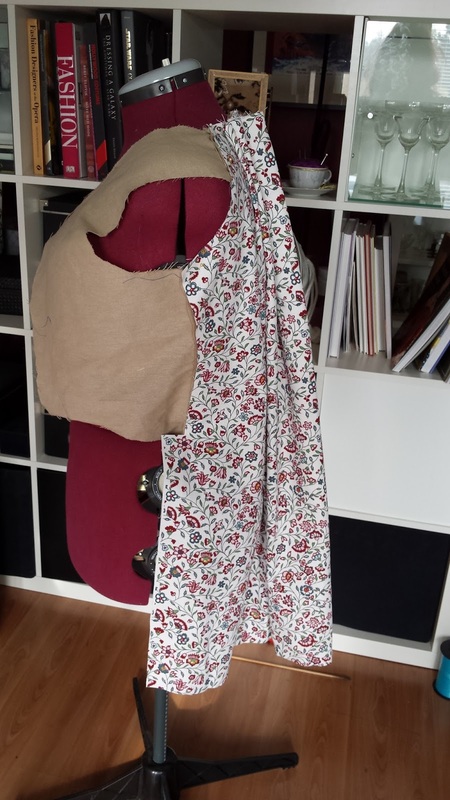 This weekend I decided to start on a pattern for it though, and I want to start with making a jacket version, or pet en l'air as it's also called. 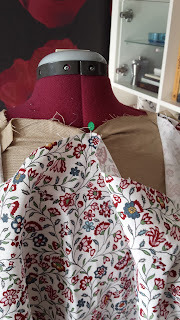 That way I can figure out the pattern before ordering a lot of expensive fabric, and I can wear the jacket with my existing petticoats and bumpad without looking too bad. I was thinking for a long time if I should order a pattern or not, but decided not to. I didn't start from scratch though. I started off with my Reconstructing History 822, that I used for my navy anglaise. I was after the fitted lining. 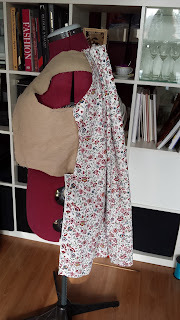 I put the pattern pieces for the lining of RH822 on my muslin fabric and then opened p 34-34 of Patterns of Fashion, since that is a sack gown with all of my favorite elements, not the least that there is a seam between the bodice and skirt part in the front. 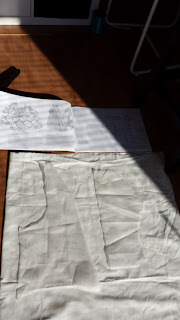 I simply used the RH822 as a base and folded the pieces until they looked like in Patterns of Fashion. 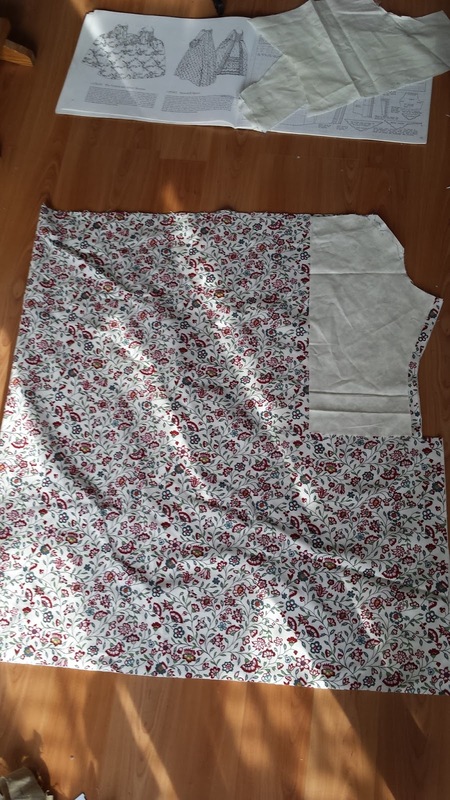 I sewed the muslin pieces together for a quick fitting and then used them as a pattern for the lining. In the back of the lining I added ties so that I will be able to adjust the bodice. 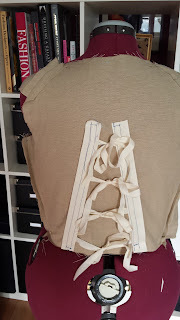 I had first planned to have lacing in the back, but this is a more simple solution from La Couture Parisienne. The vertical lines are boning channels, made from cotton tape and with a piece of plastic whalebone to stabilise the tied tapes. For the back piece I used a full width of my main fabric. 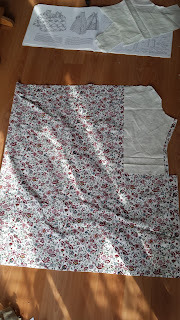 I cut out the shaped side seams, sleeve opening and shoulder seams. 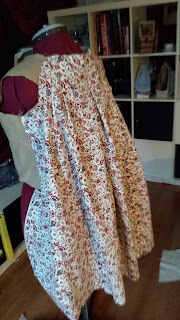 I did my first test of just foldng the fabric to see if I was on the right way. As you can see I'm using my dress form. It is not the shape or size of me in a pair of 18th century stays, but it works as long as I'm just working with the back. I can't drape the front ont he dress form. 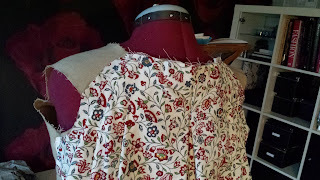 I attached the outer fabric directly on to the lining at the shoulder seams and the side seams. When it was time to start draping I first marked the center on both the lining and the outer fabric, so that I could pleat one side at a time. The pleats are stacked box pleats. I could probably have stacked them more, now the bottom pleats are peaking out from under the top pleats. 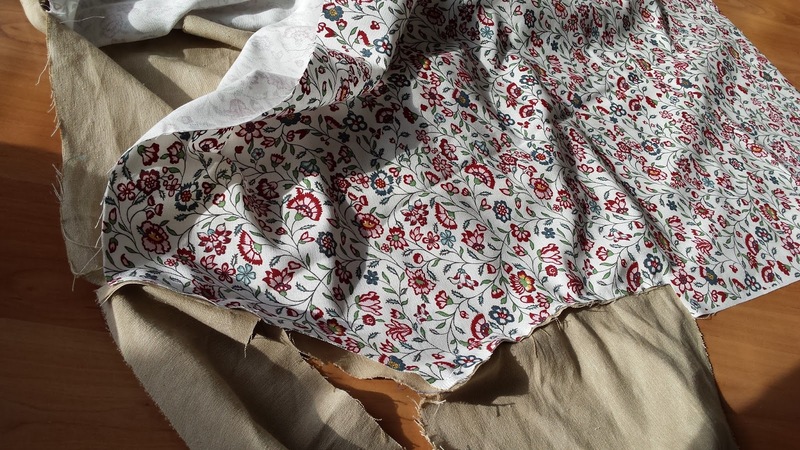 The pleats are handstitched to the lining for the first ca 5 centimeters.